A mistake that many homeowners make is to overlook the flooring when it comes to establishing the decor and feel of the home. However, what most people fail to realize is the massive impact that the correct type of flooring can have on the overall look, feel, ambiance, functionality as well as the resale value of your home. Whatever type of floor you might prefer, exploring all your options is the best way to figure out which one is going to work best for your home’s design, location, your lifestyle, and your budget. If you don’t do your research, it could end up being a disaster. On the other hand, selecting the right type of floor with a professional finish could leave you with a feeling of great achievement as you enjoy your beautiful flooring for years to come. Before you can actually go ahead and have your new floor installed, there are a few key factors you have to consider. Flooring is priced per square foot, and this can quickly add up. How big is the area you have allocated for new flooring? Will you be attempting the installation yourself? DIY installations could cut your costs in half, but you also run the risk of poor installation, which may end up costing you more in the long run. Should you opt for professional installation, you’ll have to figure in labor costs. Your best option is to first figure out how much money you have to spend on your flooring project, and then compare estimates from several contractors. Once you start comparing estimates, you’ll get a much better idea of what is possible within your allocated budget. The way you and your family live and use your home will have a profound effect on the type of floor that will suit you best. If you have a big family and some pets running around, you’re likely to have several high-traffic areas. 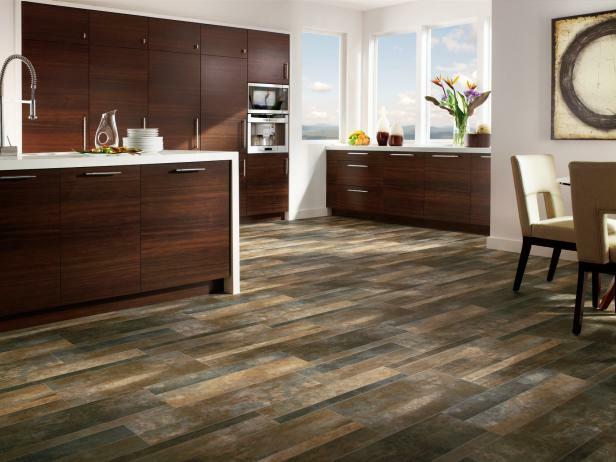 You should opt for resilient floorings like ceramic or porcelain tile, laminate flooring, or even plank vinyl flooring. On the other hand, if you don’t have a large family with minimal traffic, your flooring options could change and you could opt for something that’s softer underfoot. Are you interested in a floor that requires very little maintenance, or is maintenance not a major concern? Wood, for example, should be swept or vacuumed regularly if you are to maintain it well. Neglecting it will eventually leave it looking dull and scratched. Stone’s finish will also succumb without some regular sweeping. If low maintenance is your primary concern, you might opt for tile, sheet, or some laminate flooring. On the other hand, if maintenance is not the most important factor, solid or engineered flooring might be a good option. Which area have you selected? Is it an area that receives a lot of direct sunlight, or is it a darker area? Sunlight could contribute to your hardwood floors fading over time. If it’s a darker area, lighter floors could brighten up the area and even make the room look bigger. If it’s flooring for your bedrooms, it should be some flooring that’s comfortable for bare feet. 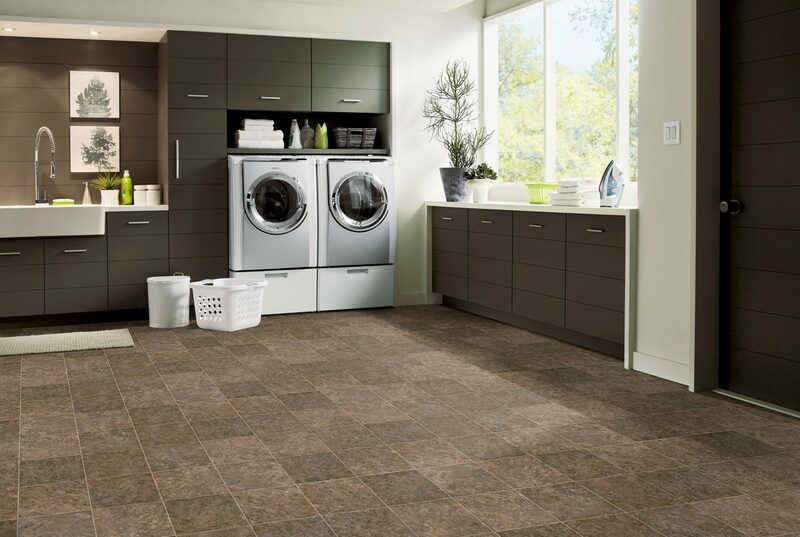 Are you perhaps considering new floors for your bathroom, basement, or laundry room? These are areas that might experience high moisture, and you should consider vinyl tile, concrete, ceramic or porcelain tile. If the area of installation is not prone to high moisture, you can consider any type of flooring. If you are redoing your entry or foyer, you should consider something with a wow factor. However, should snow and mud at the bottom of your shoes to be a factor, the entry to your home should probably have some durable flooring. 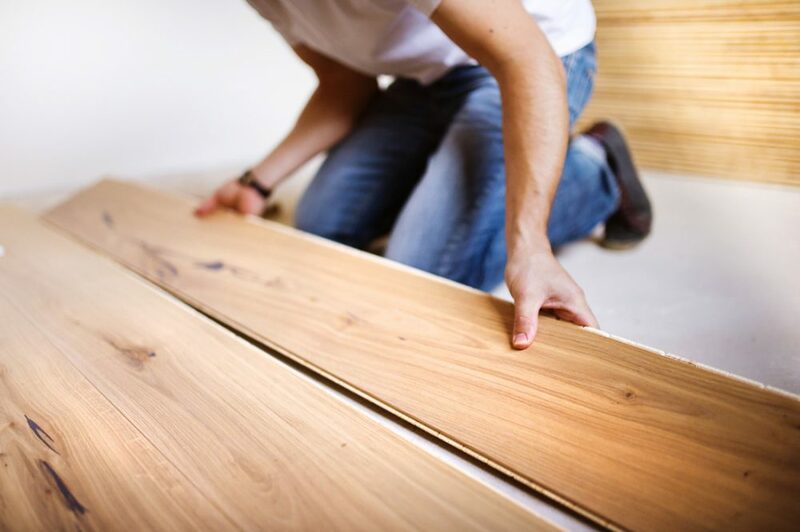 When you have the need to lay down a new floor, it’s very important to get in touch with a local professional to get some expert input on what type of flooring will be best suited for your particular project. Request some samples such as wood flooring contractor costs and see how it will match up to the look of your home. Also be sure to compare several estimates from reputable contractors in your area if you want to ensure you get the best price possible. Vinyl is one of the easier flooring materials to work with and install. Vinyl comes in sheets, rolls or can also be purchased as individual tiles. Although many homeowners think that installing vinyl flooring might make a good DIY project. However, some vinyl flooring has the peel away back with sticky adhesives already attached while others may require that you apply the adhesive yourself, and this could make installation a lot tougher. To top it all off, measuring and cutting your material to fit around pipes, drains, cabinetry and other tricky areas could be a real issue. That’s why professional installation should be your first option if you want to create the finish you really imagined. Vinyl flooring is low-maintenance and relatively easy to care for. Simply using a damp cloth or mop should be enough to keep the surface clean, and you also need to ensure that grit and other pieces of dirt are swept away the easily maintain the floor’s surface. Vinyl is also water-resistant, making it perfect for the bathroom, laundry rooms, kitchen, or any other area that might experience excessive moisture. A well-installed vinyl floor should be totally water resistant. Furthermore, vinyl is a relatively inexpensive material that can mimic the look of more expensive materials. You can find this product in a number of styles that simulate a specific type of wood, such as oak, hickory, and several others. Vinyl is very durable too, so it stands up well in areas that experience heavy foot traffic. When properly installed, vinyl flooring can last up to 20 years, but this will largely depend on the quality of material that you’ve purchased. Vinyl is a product of polyvinyl chloride (PVC). This material emits volatile organic compounds (VOC), especially when the product is new. 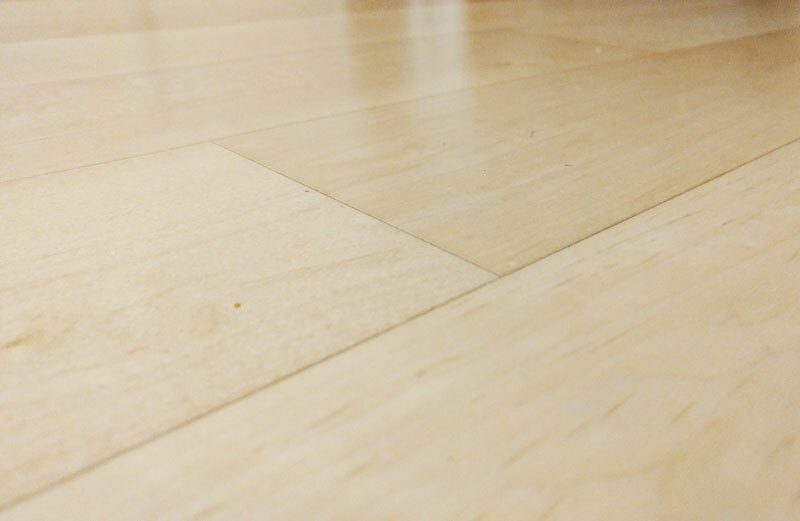 Since 2010, however, many manufacturers have started using less PVC in the production of their product, but it is still prevalent in many manufacturer’s flooring. Although durable and easy to maintain, vinyl flooring can easily be damaged by sharp objects. Installation of vinyl flooring can become problematic due to the subfloor preparation that is required. If the subfloor is not properly cleaned and prepped, peel-and-stick vinyl tiles will not last. Repair can also be extremely problematic when tearing and rips damage the floor. This type of flooring is obviously less appealing than hardwood or stone flooring, and it doesn’t offer much in terms of a home’s resale value. How Much Will It Cost To Install Vinyl Flooring? The overall cost to install some vinyl flooring will depend on several factors. On average, however, for a 200 sq ft area, expect to pay in the region of about $700, This is based on the costs of materials for a DIY project if you have the necessary experience. Should you opt for some professional assistance, the price will fluctuate depending on your location and the contractor you choose to work with. Ultimately it will come down to the exact type of type of vinyl flooring you choose. Keep in mind that different patterns, textures, and even the durability of the product will inevitably all make a difference in the price. An estimated average price for the sheet or roll of vinyl flooring should cost anywhere between $3-$5 per sq ft, but it’s highly recommended that you compare estimates from local contractors to get a more accurate idea of what you should be paying for your particular project. 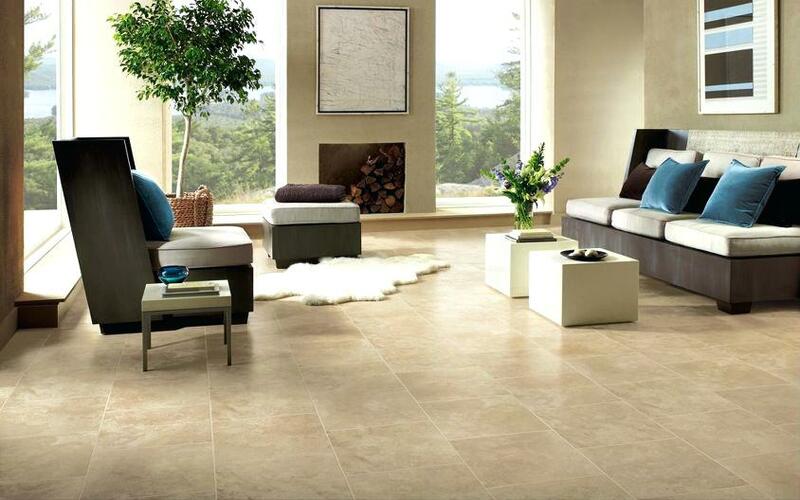 Stone flooring can give your home that stylish and fashionable look that will last for years to come. Stone offers form and function that is suitable for any room in your home. In fact, stone flooring is one of the few options a homeowner can use both on the inside as well as outside of the home. There are a few different types of stone flooring that you can choose from, so it’s critically important to select the right type of material for your particular requirements. Homeowners can choose between marble, granite, limestone, slate, quartz, or travertine. Choosing the wrong one could end up leaving you with an unsatisfying result, so be sure to research and ask a professional for some advice on which one will be the best fit for your particular project. One of the major attractions to stone flooring, apart from the warm, pleasant ambiance it creates, is the fact that it’s so durable. Think about some of the most ancient structures on earth…and stone immediately comes to mind. If you are going to stay in your home for many years to come, stone flooring is definitely a solid choice to go by. Another advantage to stone flooring is the fact that it can keep your home cooler. This is especially attractive if you live in the warmer states. In colder states, this can be overcome with some underfloor heating. Stone may also not be the cheapest option, but it’s attractive natural aesthetic can increase the value of your property tremendously. Stone comes in wide variety of color and pattern options that can add a unique and timeless beauty to your property. That’s why homes with quality stone flooring often tend to sell for a higher price. Stone flooring is also eco-friendly and easy to maintain in some cases. It’s virtually stain resistant, and when scratched, it can simply be re-polished. Stone flooring is not the cheapest of options, which is one of the main reasons why some people will not opt for this material. Some stone types are also porous and might need regular treatments with a sealing agent. Because stone is such a heavy flooring option, you might be required to have some support in place before it can be installed. Stone tiles might also be uneven due to the layering qualify of the stone. Laying stone can be a very time-consuming process and it has to be done by a knowledgeable professional or you might not get the finish you actually envisioned. Manufacturer’s grade: This falls on a scale of 1-3 with 1 being superior materials and a 3 indicating damaged or mismatched pieces. Non-Vitreous or Impervious: This rating indicates the absorption rate with Non-Vitreous being highly absorbent and Impervious having the lowest absorption rate. Coefficient of Friction: This indicates how slippery a material will be when it is wet. The lower the rating, the more slippery the surface will be when it’s wet. This is an especially important factor to consider because you wouldn’t want to put a low coefficient in the in the bathroom. Before you decide to go ahead with your stone flooring installation project, it’s highly recommended that you get in touch with a local professional to get some advice on what’s going to work best for your home. It’s also a good idea to compare estimates from multiple professionals so that you can be sure you’re not being overcharged. Laminate flooring s a floor covering made of several layers of material and has been a popular choice among homeowners for a long time. It consists of a clear top layer that provided resistance to stains and fading. Underneath this is a high-resolution photographic image that realistically captures the look and appearance of wood. This flooring option was originally created as an affordable alternative to hardwood in the 1970s. Arguably its biggest appeal is the fact that laminate takes on the appearance of wood without the high price tag that comes with hardwood flooring. Back then, laminate still has had kind of a plastic look to it, but with today’s advanced printing methods, it has become hard to tell the difference between real wood and laminate flooring. 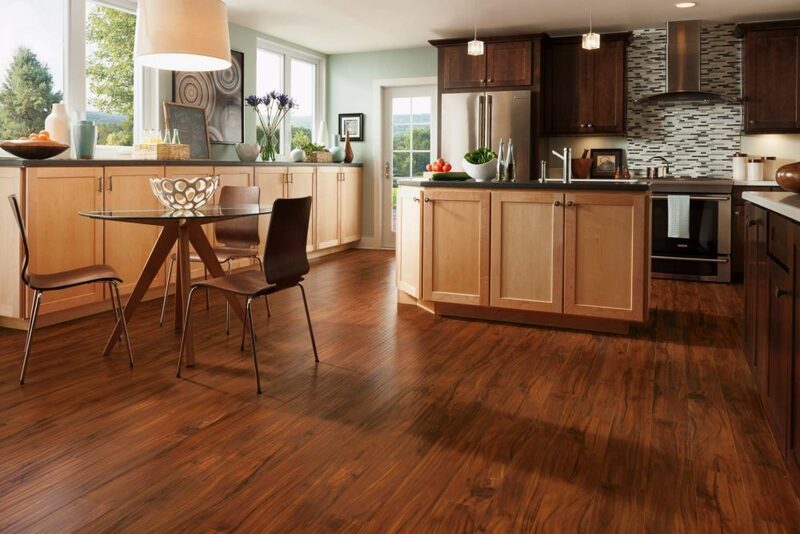 Although laminate can a be confused with vinyl flooring also, it differs drastically. For one, laminate does not attach to the subfloor. Instead, a foam underlayment is present between the subfloor and the layer of laminate. Laminate flooring is one of the most durable and long lasting options on today’s market. Most of the manufacturers out there will offer a warranty for anywhere between 15-30 years. It’s available in a wide selection of designs too, so finding one that fits in with your home’s particular decor shouldn’t be too hard to do. Laminate flooring is easy to install. The pieces come as planks, or tiles, with edges that can be snapped together for easy installation. This type of flooring can be installed over just about any surface like concrete, wood, plywood, OSB, or vinyl flooring. Laminate is also very easy to clean. A damp mop, vacuum, or broom can all suffice. Best of all, there’s no waxing required for your laminate to keep its look. This type of flooring is also ideal for moist areas like kitchens, bathrooms, and basements. As long as installation has been done correctly, your laminate flooring shouldn’t run the risk of damage from moisture. Laminate doesn’t run the risk of getting dented and scratched by sharp edges from your furniture of high heel shoes either, one of the primary reasons why homeowners install this in areas with high traffic. Since laminate flooring isn’t real wood, you can’t decide to sand and stain it at a later time to achieve a new look. If you ever want a new look, you would be required to remove the old laminate totally and redo the installation. Some people may also have an aversion to laminate due to the fact that it looks like wood but it isn’t. This could inevitably affect the resale value of your home. Should your flooring not be installed professionally, the laminate can be susceptible to moisture damage. When exposed to standing water, it will start to break down and expand. Once damaged, you’ll have to replace it because laminate is hard to repair or patch. The plastic layer contained in laminate flooring doesn’t degrade in landfills, making this product less environmentally friendly. The size of the area you wish to cover. The type of flooring material you choose. Whether or not you need to replace or repair any of your sub-flooring. The type of trim work you wish to use for the borders of the room. Where you live and the availability of local laminate flooring installation contractors. Generally speaking, the cost to install laminate flooring could come in anywhere between $550 all the way up to as much as $6500. The only way to figure out how much your product is going to cost is by requesting quotes from local contractors. By comparing estimates you will be able to discuss all your options as well as get a better understanding of the current pricing trends in your area. Linoleum flooring is still enjoying popularity today, even if it does sound a bit outdated. Linoleum floor installation allows you to add more color to any room. Linoleum is also very resilient and many manufacturers add a protective coating that helps against scratches and fading from exposure to sunlight. Many homeowners opt for linoleum because it’s low maintenance and environmentally friendly. Often people mistake linoleum as plastic flooring when, in fact, it’s actually produced from all-natural materials. These include linseed oil, ground cork dust, wood flour, limestone, jute backing, and pine rosin. This also means that linoleum flooring is recyclable. It is a durable product with a lifespan of anything between 30 and 40 years. The stain resistant qualities also make it perfect for areas that have high traffic, including the kitchen, corridors, dens, and bathrooms. Dry and wet spills can easily be dealt with without damaging the floor. In fact, linoleum is one of the flooring options that require the least amount of maintenance. Taking care of spills is easy, and once installed, linoleum requires some routine damp mopping to prevent microbe growth, dust collection, and outdoor allergens. And since the colors in linoleum run right through the material, the design patterns are more resistant to wear, which may just consist of a top layer of coloring in other flooring options. Linoleum flooring is also very attractive to many homeowners due to its price. Compared with other flooring materials, like hardwood or ceramic tiles, linoleum is definitely a more affordable flooring solution. Many of the linoleum flooring options on today’s market imitate expensive flooring like wood, stone, and granite…with an untrained eye unable to tell the difference. There is a downside to installing linoleum. Sharp objects like high heels and furniture legs can damage its surface. It can also be susceptible to dampness when exposed to excessive moisture. Be very careful when installing this type of flooring in your bathroom or laundry rooms and ensure that there will be no unnecessary contact with water. If your basement has a history of leaks and flooding, linoleum is probably not your best option. If the product you choose does not come with a factory-applied protective coating, you may also experience what is knows as “ambering”. This is when your linoleum darkens or turns yellow due to excessive exposure to sunlight. Another factor to keep in mind is that linoleum can be extremely dangerous when newly waxed, and slippery floors can often lead to unfortunate accidents. How Much Does Linoleum Flooring Cost? The cost to install linoleum flooring will depend on several factors, and you should always compare several estimates from local contractors to get a better idea of the current pricing trends in your area. However, on average, linoleum can usually cost anywhere between $2.50-$3.50 per square foot. The cost to have it installed by a local handyman begins at around $300 per 500 square foot but it can be much higher depending on your location. You should budget anywhere in the region of about $1700 per 500 square feet for vendor-supplied contractors while ordering materials and installation directly from a trusted flooring designer can go for as much as $2800 in some situations. Why not get in touch with a local contractor to get a more accurate estimate for the cost to install linoleum flooring in your home.